It’s a hard task to succeed in the entry level hatchback segment. There is absolutely no guarantee to make it big even if you have a better car in all ways possible than a Maruti Suzuki because this segment works on network, service and cheap maintenance. The car needs to be light, efficient and easy to drive for the first time car buyer too and Maruti has done a damn good job at it with the Alto. So the Renault Kwid has to deliver on other fronts, and find its own niche to stay clear of the Alto buyer but take on Hyundai’s Eon. It has to offer enough and more over its well established rivals to be taken seriously in this cut throat entry level hatchback segment. Can the Renault Kwid be that good? Clearly at first glance, the Kwid looks like a hatchback that does not want to appeal to the no nonsense Alto car buyer. This segment works on a matter of a few tens of thousands rupees, so for those who can stretch budgets a bit, it has always been the Hyundai Eon to go to. You get the extra bit of feel-good factor with the quality of materials, features and an overall accomplished design that you don’t get with an Alto. The Kwid wants a slice of that segment. And Renault says so in not as many words but in the design of the Kwid. It looks much like a compact SUV with a chunky grille and flared wheel arches. The headlamps and taillamps are simple yet neatly designed and the sculpted bonnet and front bumper give an impression that the Kwid is a more premium offering than cars of its class. Unique bits like the turn indicators on the front wheel arches and the variant badge on the C-pillar stand out right away. It is a budget hatchback after all and costs saving bits are hard to miss. The wheels have just three lug nuts, much like the ones seen on the Nano, the door handles are not body coloured, the ORVMs are simple plastic clad units that have to be adjusted manually and you get vinyls for the side strips and not actual cross hatchback like body cladding. You also get one big wiper up front instead of two, which sure will leave a large patch of dirt on the windscreen in the rains. I admire the package overall though. It has a certain degree of desirability that cars like the Datsun Go can’t quite offer. The quality of plastics for a car of its price is quite good except for places like the door handles and aircon controls but overall the Kwid doesn’t look like it’s built cheap. There are plenty of storage spaces in the Kwid – two glove boxes, the top one with a bottle holder, two bottle holders in the front door pockets and plenty of scooped up places in the dashboard and in front of the gear lever. The seats are of the foamy, cushiony kind, and well contoured for the front passengers. The headrest is integrated and there’s decent under thigh support. It’s a spacious entry level hatchback, and in terms of boot space, it’s better than a few cars above the segment as well. At 300 litres, you can carry a big suitcase and an overnighter comfortably. The Kwid comes with front power windows, central locking and air conditioning. In addition, the top end Kwid gets the Touchscreen system offered in the Duster and Lodgy. It is a big feature for a car of this class and the few buyers who want to splurge a bit for their budget hatchback, will love this Touchscreen system. It comes with Bluetooth telephony and navigation in addition to the usual radio, and USB connectivity. The maps aren’t as accurate as google maps, but other navigation systems too suffer from google levels of quality. The audio system comes with two speakers up front, and for the two lower variants below the top end RXT variant you see in these pictures, there’s a single DIN stereo with radio and MP3. To keep entry level prices down, the base variant is bare bones basic while the RXE variant that sits above the base version gets the music system as an optional feature. What we don’t like is that the Kwid comes with one airbag that is also on the options list, even on the top end variant. About 80 percent of the development of the Kwid comes from the Indian R&D team’s contribution and herein comes the high levels of research into weight savings and efficiency. The Kwid sure is a global product but India is its most important market, which is why it goes on sale here first. Renault says that pricing was so important that there was no alternative to localizing the entire car, and the French carmaker has come close. 98 percent of the Kwid’s parts are sourced in India. Coming to the weight savings, during engine development, which is an all new 3 cylinder 799cc motor, the cylinder block was chosen to be made of aluminium, like most small lightweight engines are. Things like the intake manifold and oil pan are made of durable plastic and the crankshaft is made of steel. This 3-pot mill develops 54PS of power at a fairly decent 5,678rpm and max torque is rated at 72Nm at 4,386rpm. Since the car weighs just 660kg, it gets an impressive power to weight ratio of 85PS per tonne. It’s a smooth engine with a sprightly low and mid end but suffers from lack of power high up the rev band. You can short shift and stay in a higher gear without losing much speed. It’s not going to be a blast down the highway but the Kwid is quick on its feet nonetheless. The 5-speed manual gearbox is easy to use and the ratios are spaced well for city use. You don’t feel the vibrations in the gear lever that’s an annoying feature in the Alto. The pedals however could do with a bit more play, both the clutch and the brake. NVH levels overall are under check, even with the aircon on full blast. The Kwid feels well put together for the most part. A lesson Renault has learnt with the Duster is that a rugged high ground clearance car will find its takers here and with the Kwid, the carmaker delivers just that. Riding high at 180mm, the Kwid has the highest ground clearance in its class. And considering it’s a short wheelbase, this will be more than enough to go over just about every large speed breaker the country has in store for it. The high ground clearance also gives excellent visibility out of the driver’s seat making it a very easy car to drive around town. What impressed us right away is the ride quality of this tiny hatchback. The Kwid uses MacPherson struts up front and twist beam suspension at the rear and the setup is tuned to perfection for our roads. Large undulations are evened out impressively and broken roads don’t throw you about inside the car like most hatchbacks in this segment do. The nice chunky steering and the driving position are spot on. You sit at a good height and there is no offset pedal nonsense or steering on your chest sort of feeling that budget cars tend to have. The Kwid has considerable roll but not of the scary kind. You know you can keep it together when you are hustling this Renault baby, and in fact it is good fun to chuck around corners, much like the Alto. Just 660kg of mass to stop does ease pressure off the tiny disc brakes up front and the drums in the rear. The brakes could do with a bit more play though and the 155 section tyres with a bit more bite. When weight is on your side however, you can get away with a little less grip. Renault should however have an ABS equipped variant in the lineup too, which is not on offer as of now. The Kwid’s major claim to fame is going to the surprisingly high levels of mileage delivered by the three-pot motor. Renault has received an ARAI certified efficiency figure of 25.17kmpl, which makes it the most efficient petrol car in the country. But it being just a 800cc motor that is bound to be revved high most of the time to keep it in the powerband, don’t expect it to be as efficient as the official figures state. The Kwid will be launched next month and bookings commence from September 14. Expected prices will be in the range of the Rs 3-4.5 lakh mark which makes for a highly competitive car. There is no denying the fact that Renault has done its homework well. 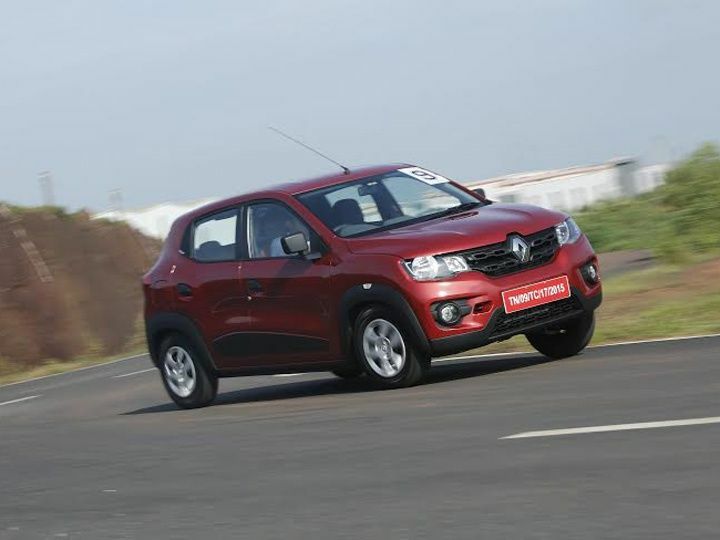 The Kwid enters a cut throat segment that spares no mercy for any new entrant. And so Renault is giving it all… A good refined engine, high mileage, lots of features, more space than top competitors for both passengers and boot, easy to drive character and a design that makes it more desirable than utilitarian. And it’s not just the car but the work around it too that should play a factor in its success. Renault claims the lowest ownership cost in its segment, easy availability of parts and a growing network of sales and service outlets to appeal to car buyers from smaller towns and rural regions of the country. If you have a Renault dealer in your city, hold on to your Maruti or Hyundai cheque because the Kwid deserves your attention before you sign that dotted line. Share your experiences with KWID?